It is possible either to cool or to heat a planet, or to redistribute the heat, cooling the equator while warming the poles, by use of rings of reflective material about the planet. For example if a planet were to be too hot at the equator, that could be climatically altered by placing a fairly low orbit ring to block and reflect part of the isolation that would have struck the equator, thus radiating' it to space. 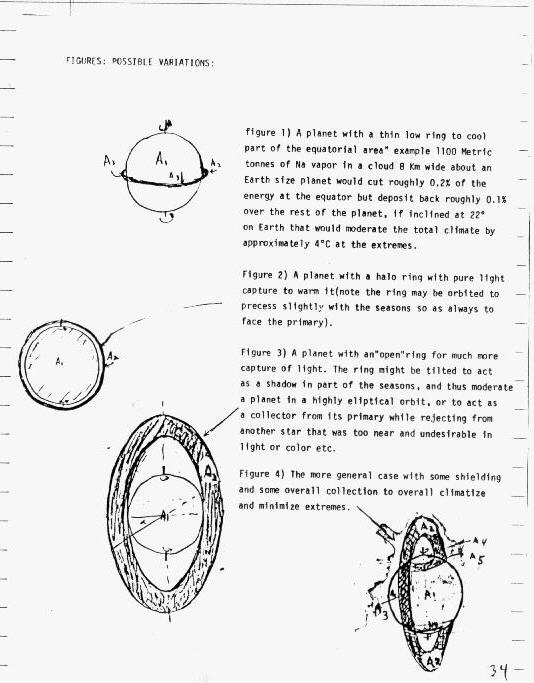 and reducing the total heat input, In the reverse case a ring placed so that it does not obstruct incoming light, but so that it does reflect some light from the ring to the planet that would not have Otherwise reached the planet can raise the temperature by rather large amounts, up to double being easily obtained. In the case of a low altitude ring the solid angle Subtended by the planet and by the open space are approximately equal, and thus half the reflected light would reach the planet, and half would he reflected away into space. Thus the heat gathering ability is far less than the heat rejection ability which can approach 95% of the incoming light. 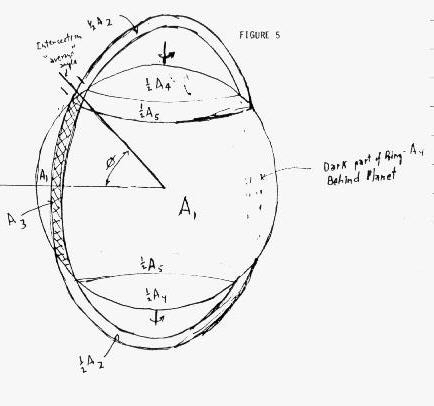 The ring can be set to reject selectively into space- with virtually none of the reflected light striking the planet, The planet thus is cooled to the extent of the shadowing or the area of the planet times the percent loss from the presence of the ring. In trying to re-distribute the energy, The problem becomes more complex. In the most general case there are four distinct areas to be entered into the computation. The total area of the planet is A1+ A3 +A4 as seen from the primary (Sol). where the n’s are a combination of the reflectivity and geometry (i.e. the fraction of the planetary surface that receives light from that area)- with the third term having been simplified by assumption that the reflected light half strikes the planet and half is rejected to space- which is not always true...i.e. that light which passes thru strikes the planet anyhow--that which Is reflected still some strikes the planet. Because of the energy rejection that area Shadowed (A1) is cooled to the extent of the loss by the shadowing area A3, and heated by the added light received from A2-note that the cooling is strongest at the equator which receives virtually no A2 light, and tapers to A4 which receives maximal benefit with no cooling and much A2 enhancement. effect will be cooling, at lower the net effect will be heating of the equatorial regions. adding the three zones ( A1 A4 and A5). together. to provide mere living room in the near solar System (lebensraum).